The Total War franchise has been around for quite some time, letting us take massive historical legions into battle to dominate the land and reign supreme. Many found that the series was starting to grow old with repetition until they switched gears and took the franchise down the historical texts of the Records of the Three Kingdoms. If the name sounds somewhat familar, Koei Tecmo has based two gaming series entirely on these records: Romance of the Three Kingdoms and the more popular Dynasty Warriors. Total War has taken this rich and complex history full of nuanced and elegant warfare and created a fresh new entry in their series, but for more on that check out our video preview below. Total War: Three Kingdoms is the latest entry into the long standing turn based series in which players control incredibly massive armies and move about a beautifully detailed landscape, littering it with the bodies of their foes. The game features 11 playable factions in which you must eliminate the opposition and become the single unifying leader of ancient China. 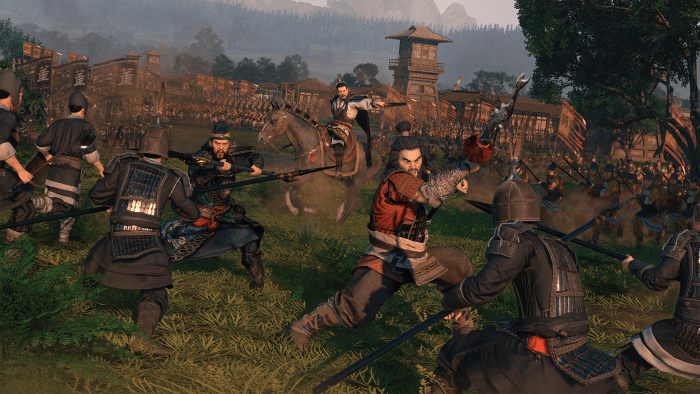 Total War features real historical warlords and heroes such as Cao Cao and Lui Bei, among many others you may have seen in the other Three Kingdoms games. The game is played top down and will allow players to hire generals from any allegiance – not being limited to their historically accurate allies – as well as sending them out into battle alongside the troops. Total War: Three Kingdoms is set for release on March 7, and will be available on PC and Linux. For more information check out the game’s official website, and be sure to keep an eye out for our full review of the game as we inch closer to release.